Pretty basic ingredients here. 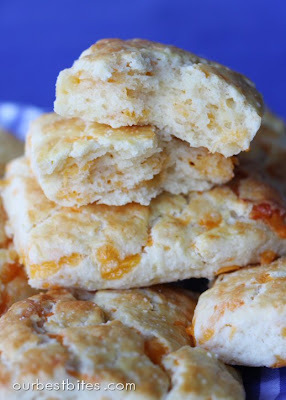 One of the tricks for good biscuits is to make sure all of your ingredients are COLD. 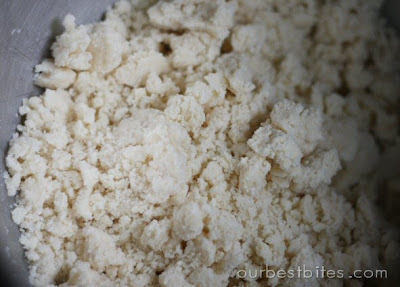 Before you mix up your dry ingredients, take a spoonful of your flour and mix it with your grated cheese. This will prevent the cheese from sticking to itself and then it helps distribute it throughout the dough. Start by combining the flour, baking powder (a whole tablespoon of it!) and salt. Then cut your cold butter into chunks and cut it into the dry mixture. Once the butter is the size of small peas (ya know, as opposed to really large peas…) add in the buttermilk and the egg. Mix it until JUST combined. Don’t over-mix! Then add in that grated cheese. Even if you don’t like plain sharp cheese, it’s SO much better to use sharp cheddar in things like this because it allows the cheese flavor to come through. You probably won’t be able to really taste the cheese if you use a plain, mild cheddar. The extra-sharp in this recipe tastes amazing. Once again, mix just until combined. Are you noticing a trend here, need I say it one last time, don’t over-mix! If your dough is really wet, you can add a little more flour at this point. Just be careful to not add too much. You’re going to add more when you shape it so don’t be scared if the dough is on the soft side. Turn it out onto a floured work surface. Flour all sides lightly. If you need to, add enough flour for the dough to hold together. Roll it out into a rectangle about 10 x 5 inches. Cut it once down the middle and then 3 times down the other direction like in the picture below. These are actually really large biscuits, you can easily make 2 cuts instead of that one lengthwise and get 12 biscuits. 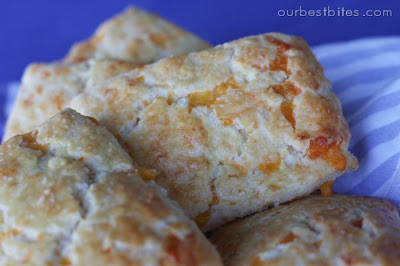 The little bits of cheddar woven throughout add an amazing flavor dimension, plus they look pretty too! And the insides are airy, light, and perfectly flaky. Ina Garten served these for brunch with scrambled eggs. That combo would be heavenly! As I mentioned before, they’d also make a perfect accompaniment to soup or a back yard bbq meal. 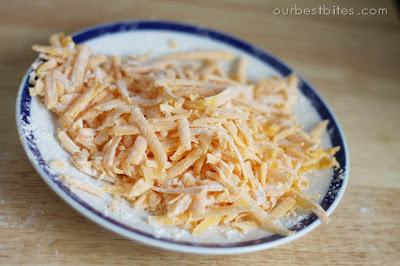 Measure out 2 Cups of flour and then remove a spoonful of it and mix it with your grated cheese. Set floured cheese aside. Place the remaining flour, baking powder, and salt in the bowl of an electric mixer fitted with the paddle attachment. With the mixer on low, add the butter and mix until the butter is the size of peas. 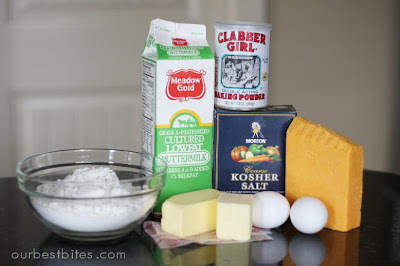 Combine the buttermilk and egg in a small measuring cup and beat lightly with a fork. 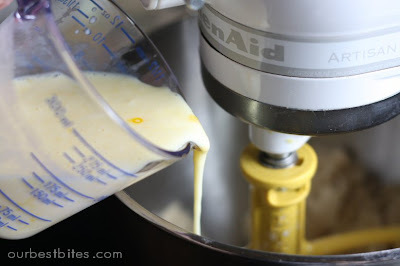 With the mixer still on low, quickly add the buttermilk mixture to the flour mixture and mix only until moistened. Add the cheese to the dough. Mix only until roughly combined. Dump out onto a well-floured board and knead lightly 3-4 times. 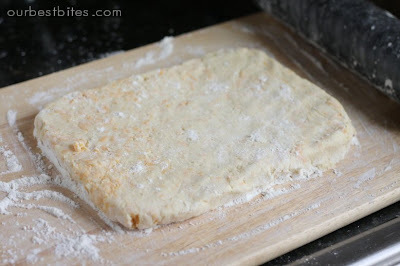 Roll the dough out to a rectangle about 10 by 5 inches. 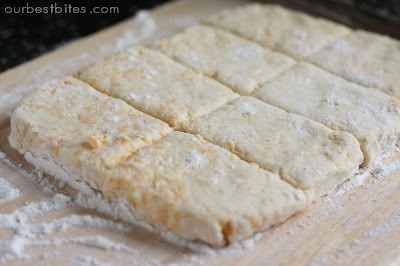 With a sharp, floured knife, cut the dough lengthwise in half and then across in quarters, making 8 rough rectangles. 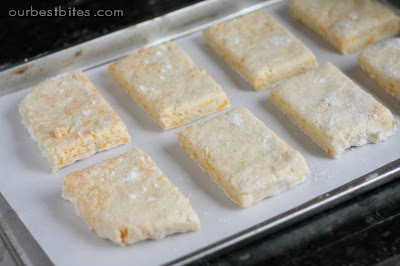 If preferred, cut to make 12 smaller biscuits. Transfer to a sheet pan lined with parchment paper. Brush the tops with the egg wash, and bake for 20 to 25 minutes, until the tops are golden brown and the biscuits are cooked through. Serve hot or warm. The biscuit dough looks absolutely amazing!! Wow. I'm bookmarking this recipe. I love the process photos. oh yeah, these are gonna be made this week. maybe i'll share with my family. if I add a clove or two of garlic I bet they'll taste just like the ones at Red lobster! Just checking — is there any reason these couldn't be cut with a round cutter? I don't know why, but when I make biscuits, I like them round. These look delicious, and I can't wait to try them! if you happen to be interested or anything. So yeah. These look wonderful. I think I will be making them this week! You have baking soda listed in the directions on top and baking powder listed in the recipe. Which one should I use? These look fabulous. I agree, I think they would be great with ribs. But what isn't great with ribs? I'll definitely be trying these! They look amazing! 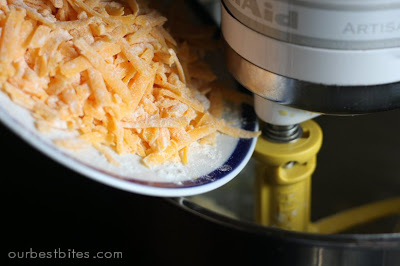 Little tip for those who use stand mixers – if you put your to-be-added dry or grated ingredients on a paper plate or a flexible cutting board, you can bend the plate/board slightly to conform to the edge of the bowl and tip the ingredients in. This has saved me from having to clean up many a mess on the countertop. Megan- You can definitely use a round cutter. Doing them in rectangles just makes it quick and easy, but if you don't mind doing the cut-roll-cut-roll thing, go for it! Linda- Thank you! DEFINITELY baking *powder*! I'll go fix that. knitwych- great tip, thanks for sharing! Ummm. WOW!!! My greedy eyeball just popped out. Oh dear, yet another recipe i am going to have to try! These look so good. You can't go wrong with cheese and bread! That's what I thought, but I wanted to check. Thanks! 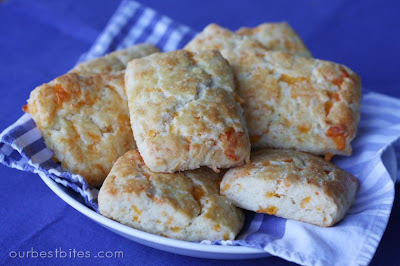 I love cheese biscuits! They look so delicious! Two strikes against me! Cheese and carbs!! this sounds so great. Plus so simple!!! I made these for dinner today since I have some random buttermilk in the fridge (from your Buttermilk Pancakes). WOW! I felt like a GENIUS when we were eating these biscuits. The directions were right on and set me up for real success. They were so delicious! By the way, I didn't have any real butter so I used margarine and they were still great. Just for future reference, why do you recommend real butter? GREAT recipe. Easy and really fast. I love bread, so I can't wait to try these. Thanks for sharing. Love & blessings from NC! These were oh so good…thanks for sharing! i'm the exact same way when I'm pregnant! except you left out 2 things: taco bell bean burritos and chocolate!! can't wait to try the biscuits. . .
Yum! These looked so good that I went ahead and whipped up a batch for lunch. Definitely a keeper! I totally loving those squareish biscuits! When you write that book… can you dedicate it to me? hehehehe I promise to buy at least 100 copies and share them with all my carb addicted friends! I have tried several recipes from your site and they have ALL been fabulous, but these biscuits…these biscuits are…I just don't have the words. These biscuits are AMAZING! I used extra sharp white cheddar and made them to go with Pioneer Woman's Sherried Tomato Soup. Thank you so much for all the great recipes, especially this one! Love your site! I just made these and am waiting for them to get out of the oven. This is my first time making homemade biscuits and it was definitely more difficult than I thought. I don't have a stand mixer and had flour flying everywhere with my hand mixer. Couldn't get the butter into small enough bits. I ended up adding and extra egg as well because it was not sticky at all when I tried to roll into a ball. But, I used large eggs rather than extra large, so maybe that is the problem…Anyway, I hope they taste good. Any suggestions for those of us who don't have a stand mixer? YUM. I made these tonight and added two large cloves of garlic. They were FABULOUS. I made these tonight and they were a big hit, but am I the only one who wasn't able to bake them for the whole length of time? I put mine in and after 10-12 minutes they were done. Did I just totally screw something up? I dunno Annie, but if they tasted good and looked fine, then hey, lucky you! I made these tonight, to accompany a delicious gazpacho recipe my dad and I found on the internet, they were delicious! So easy and fun to make! I am in college, so I find myself baking deprived whenever I come home on breaks, so this hit just the spot! My brother compared them to Red Lobster's cheddar bay biscuits. One thing that made my life easier is that I used a floured pizza cutter (the wheel kind) to cut the dough, and I was able to get 16 good sized biscuits out of the recipe. These were delicious! I tried them last week and was able to make them in no time. I had tried making a different biscuit recipe before and they turned out like hockey pucks, so I was a bit nervous making these. They were so easy to make, though and came out delicious! I sprinkled your garlic bread topping on these…so good! Oh liso- that extra egg with 1T milk is for the egg wash. Sorry if that wasn't clear, I'll make it more clear in the ingredient list so people don't dump that in the dough! What would happen if you were to throw in some garlic salt instead of Kosher salt? Would it affect the rising of the bread? Denise- that would be just fine, I bet it would taste yummy! These are the best things I have laid my eyes on!!! *Discovered 1 tsp of kosher salt was TOOO much salt for only 2 cups of flour…next time I will only use 1/2 tsp of salt. *rather than wasting time to roll them out, I just dropped a large spoonfull of dough onto a baking sheet. 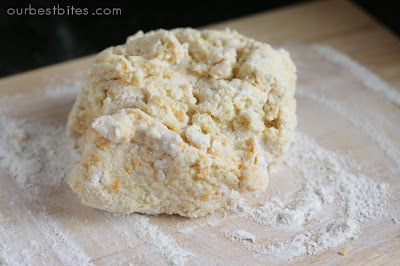 Rolling out the dough and adding more flour will make the biscuits tough. Your recipe made a good biscuit…just way too salty! Thanks for the post. These look delish! We are expecting a foot of snow here in Maine today so it seemed like a good day for Beef Stew & Biscuits. These are in the oven right now and they smell YUMMY! I threw in some gahlick and chopped parsley and used Bakewell Cream instead of the BP. (not sure if you can buy it outside of New England but it makes biscuits outrageously tall). Thanks for the recipe! I just made them tonight. They look wonderful… But I’m wondering if I did something wrong, because they had a little bitter taste to them. Any ideas? I followed your directions to a T. Love your blog and your recipes!!! No idea Brandy- maybe you have a bad batch of baking powder? My mom makes these and I LOVE them!!!!! made these for dinner, LOVED THEM! I didn’t even need a kitchenaid. Very simple to make!